No longer available for purchase as new, the Xerox Phaser 6350DT is a colour laser printer that does not support additional functions such as copying. This printer works reliably for workgroups and small to mid-sized offices. It produces professional-looking documents in full colour at a decent speed. With a sleek and modern-looking finish, this printer will suit most professional-looking office settings. Measuring 429 x 580 x 580mm and weighing 41.4kg, the Xerox Phaser 6350DT printer has been designed to sit on a desk. The Xerox Phaser 6350DT printer features support for the PhaserSMART remote diagnostic tool, which is an automated internet-based support system. It also has a series of buttons and a small monochrome LCD screen to display notifications. It supports automated duplexing and can be connected via USB or Ethernet. 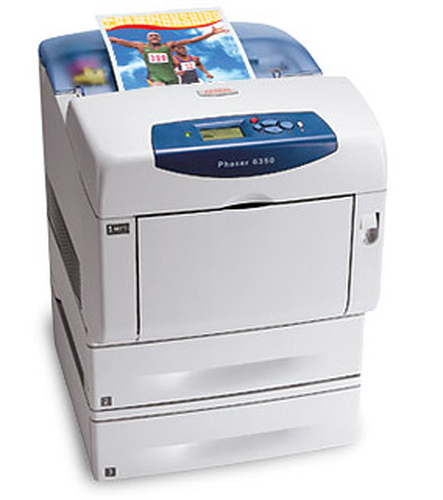 Featuring primarily off-white colouring, this printer is suitable for most office designs. The machine is Energy Star certified. With a monthly duty cycle of 120,000 pages, this printer can be counted on to deliver results of a high quality. It has a total paper capacity of 1,250 sheets, including a 150-page multipurpose tray. It has a maximum printing speed of up to 36 ppm in both monochrome and colour. Capable of a maximum printing resolution of up to 2400 x 600 dpi, the Xerox Phaser 6350DT laser printer provides support for printing envelopes, business cards, labels, transparencies, glossy and plain paper. It provides support for a wide range of operating systems and features Pantone-approved solid colour simulations. The Xerox Phaser 6350DT printer is no longer available for purchase as new, which can limit the availability of replacement parts. Offices requiring scanning, faxing or copying may wish to consider an alternative model or purchasing an additional device to cover this printer’s lack of additional functions.